So where was this guy during the Mountain Pine Beetle epidemic? According to National Geographic, the Pileated Woodpecker is the largest woodpecker found in North America. They “forage for their favourite meals by digging large, rectangular holes in trees. These holes can be so large that they weaken smaller trees or even cause them to break in half. Other birds are often attracted to these large openings, eager to access any exposed insects. 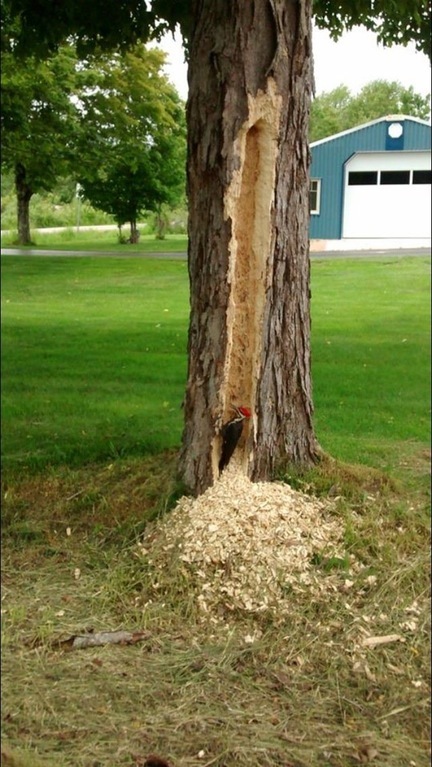 Pileated Woodpeckers don’t discriminate between coniferous and deciduous trees – as long as they yield the ants and beetle larvae that make up much of the birds’ diet.” We’re told they can peck up to 20 times per second, or up to 12,000 pecks per day, without ever getting a headache.